Liquid Chalk | The Product | Liquid Grip™ | What is Liquid Grip? An unrivaled liquid chalk. 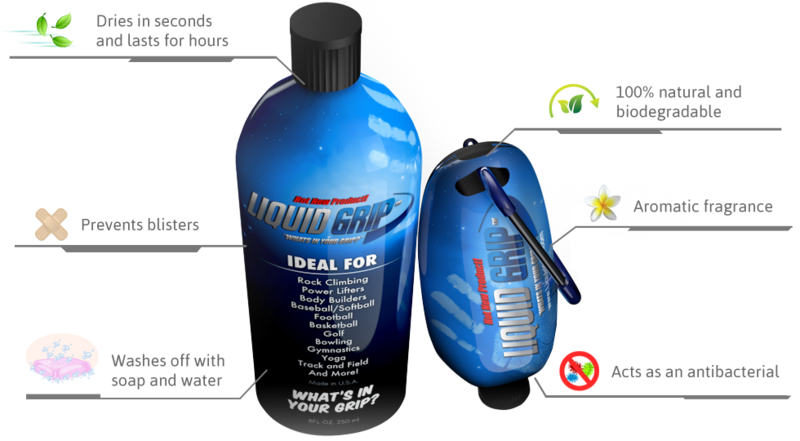 In the gym or for sports, Liquid Grip provides the ultimate grip. Liquid Grip is a water based hydrocellulose thickener that allows for rosin and chalk to mix in a suspension formula, creating a liquid chalk. This new innovative product contains an exceptional drying agent giving the user a dry and rosin feeling when applied. The product dries within seconds of applying and once dry binds with the fatty acids and does not transfer to any object. Rosin powder and chalk both leave a residue of dust that slightly transfers and ultimately can be inhaled by the user causing discomfort. Liquid Grip outperforms both rosin and chalk while leaving no mess or transfer and giving the user a longer, more effective grip. Available in 2 sizes: 1.5 fl oz. and 8 fl oz. Ingredients: Water, Alcohol, Magnesium Carbonate, Thickener, and Fragrance. All Ingredients are 100% natural and biodegradable.